Please note the Stephen Riady Centre is located at University Town (aka UTown). UTown is the newest addition to NUS and is located on the north side of the AYE (Ayer Raja Expressway) near Clementi Road. To arrive at NUS by car, take the AYE to Clementi Road. UTown can be accessed by traveling either north or south from the AYE. Travel north on Clementi Road to Dover Road. Turn east on Dover Road and proceed to the entrance gate. Travel south on College Avenue East to the roundabout. Follow the roundabout and take the lower level to CREATE Way. Drive past the CREATE Car park and look for the Stephen Riady Centre Car park. Take the elevator up to ground level and look for the registration table by the auditorium. From Clementi Road enter the campus by way of Kent Ridge Crescent. Follow the signs for UTown or for the College Link bridge that crosses above the AYE. At the Junction of Kent Ridge Crescent and College Link (opposite Raffles Hall) cross over the bridge to UTown following College Link and enter through the gantry. Proceed to the roundabout. Make almost a complete circle in the roundabout and take the lower level to CREATE Way. Drive past the CREATE Car park and look for the Stephen Riady Centre Car park. Be sure not to park in the red spaces. Take the elevator up to ground level and look for the registration table by the auditorium. Option 1: Participants are to park in the Stephen Riady Centre Car park (please see Symposium Venue Map). The charge is S$1.284 per hour and it is free after 7.30pm, and on public holidays. Option 2: Alternatively, you can purchase complimentary parking coupons for S$3.00/day from the hospitality table after you arrive at the Stephen Riady Centre venue. Ramky Cleantech Services Pte Ltd is managing the car parks at NUS Kent Ridge Campus (including UTown.) The car parks use Electronic Road Pricing (ERP) technology. Vehicle access to UTown and other NUS car parks is by In-Vehicle Unit (IU) identification for both season and short-term users. All NUS car parks have a 15 minute grace period from the time of entry. Cash Cards can be topped up at ATMs and at the 7-11 Store on campus. When exiting, please ensure CASHCARD is REMOVED from your IU before you reach the exit point. SCAN your coupon at the slot in the terminal station. Entry Station: Insert autopass/cashcard to enter. 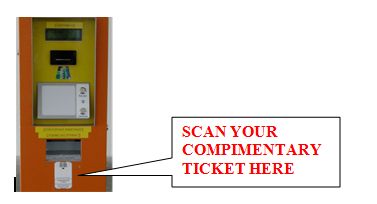 Exit Station: SCAN your coupon at the slot in the terminal station and then insert your autopass/cashcard. i) Each Complimentary coupon is for single use only. ii) The company reserves the right not to refund customers if value is deducted from their cashcard as a result of it not being removed from the IU before exiting.